The self-starting sodium lamps were first developed in this double-ended format, and are believed to have originated from Osram's Berlin laboratories in 1931. They exist in two versions, the first of which is known as the Na300-56W. A few years later it was joined by the Na600-100W variant. The first number refers to the luminous flux in dekalumens and on the German Hefner lumen scale, which differs slightly from the present day international lumen. One Hefner Lumen = 0.903 Lumens. As such their luminous flux is 3000 and 6000 Hlm, which equates to approximately 2700 and 5400 lm. The second number refers to the power consumption, 56W and 100W respectively. They were manufactured only by Osram and are believed to have been discontinued prior to 1940. A typical example is shown in Figure S36. It is interesting to note that whereas most low pressure sodium lamps have been developed to deliver the maximum luminous efficacy, these early linear sources appear to have been optimised instead for generating the maximum luminous flux with a high surface luminance. 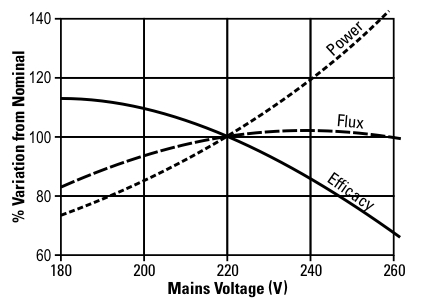 This is evidenced in Figure S38, which shows the characteristics of the Na300-56W system as a function of mains voltage variations. It is clear that in the range of typical mains voltages from 220-260V this lamp delivers maximum luminous flux, whereas the optimum point in terms of luminous efficacy would be reached at much lower mains voltages. The low efficacy is a natural result of the relatively short discharge length, which gives rise to a high discharge current density. A secondary effect of the short discharge is that the lamp voltage is rather low, which means that more power is dissipated in the ballast thus penalising system efficacy. A further drawback of the double ended lamps is their reliance on preheating of the electrodes, which makes the control gear rather complex. Yet another weakness is the fact that the low preheating current available from the ballast necessitates electrodes of rather flimsy construction, and it is presumed that their lifetime would have been inferior to the heavy electrodes employed in other sodium lamps. Owing to the small diameter light source of high brightness (about 14 stilb), good optical control is possible. Its first application was for the floodlighting of the inner courtyards of Osram's Berlin buildings in August 1931. 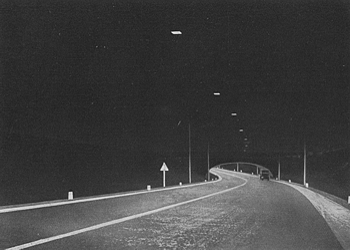 During the mid 1930s a number of more extensive streetlighting trials were set up by Osram in Germany, Austria, Italy, Norway, Sweden and Finland. Figure S39 shows a typical installation in suspended lanterns on a short stretch of the road between Köln and Bonn in Germany, 1934. In both sizes the discharge tube is made from a short length of wide bore tubing. It contains an isolated wire, encapsulated over most of its length within a small diameter glass tube. Sometimes the wire in the tube takes the form of a finely coiled tungsten filament, and it is unclear whether or not this plays any heating role to further lower the lamp ignition voltage. The tube is pierced with a small hole near its mid-point to allow the inner space to be evacuated during lamp production. Probes extend from each end of the tube and terminate in close promimity to the main electrodes at either end of the discharge tube. A small discharge initiates at these points when the lamp is first energised. The isolated wire is electrically floating inside the discharge tube. The main electrodes consist of a coil of tungsten wire bent into a simple U-shape. They are coated with the usual oxide emission mixture and are capable of being heated to thermionic emission temperature by the discharge itself, but preheating is also provided to lower the ignition voltage. In the earliest installations it was standard practice for both electrodes to be preheated, but later it was found that the preheating of only one electrode was sufficient for the shorter Na300-56W lamp. In case of vertical operation, it was recommended that the lower cathode be preheated. After ignition the cathodes are maintained at the correct temperature by the heat of the discharge. Thermal insulation of the discharge tube is provided by mounting it in a large diameter outer bulb which is evacuated to high vacuum. The insulation is improved by the presence of a secondary glass sleeve which covers all of the length of the discharge tube. This functions in the same fashion as the more modern SOI/H type lamps and serves to reflect long-wavelength infrared radiation back onto the inner discharge tube. The discharge tube is supported within this sleeve, and the sleeve within the outer bulb with the aid of coiled springs that are located between annular dimples, usually provided in both the sleeve and the outer bulb. Both lamp sizes are equipped with a large 2-prong cap, one terminal post being connected to each side of the electrodes. This 4-pin provision allows for the necessary preheating of the electrodes. 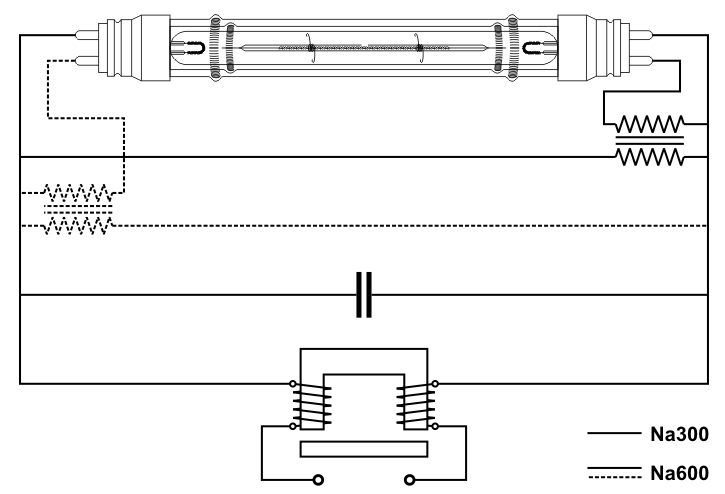 Figure S40 illustrates the construction of the linear self-starting lamps, which are both identical aside from a difference in length and diameter. To better understand the ignition process of the linear self-starting lamps, Figure S41 illustrates the typical wiring arrangement for both the Na300-56W and Na600-100W variants. Note that the second preheating transformer and its associated wiring, shown in dashed lines, is only necessary for the larger lamp. Upon application of the mains potential to the input terminals of the choke, the discharge space of the lamp is not yet conductive and no current flows. However the electrode preheating transformer(s) are wired in parallel with the lamp, so the current from the ballast instead flows through their primary windings. A low voltage of approximately 5V is delivered at the output of the preheating transformers which causes a current of 1.5A to flow through the lamp electrodes. After reaching thermionic emission temperatures, the gas filling is ionised in the vicinity of the electrodes, and facilitates breakdown to the adjacent probes extending from the glass-sleeved ignition wire within the discharge tube. Owing to the negligible resistance of the discharge it then bypasses the internal starting wire and effectively short-circuits the external transformers to cut out the preheating current supplied to the electrodes. Incidentally the ballast itself is an isolated form of choke, which is necessary to prevent the injection of high frequency osscilations into the mains supply. A capacitor of rating 0.1µF may optionally be provided to further reduce radio frequency interference. Table S7 details the principle specifications of the double ended lamps. References: Technisch-wissenschaftliche Abhandlungen aus dem Osram-Konzern, V4 pp15-19 (1936) and Elektrische Gasentladungslampen, W. Uyterhoeven (Julius Springer, Berlin, 1938).